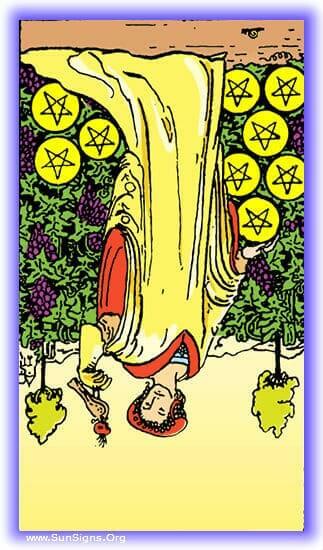 The Nine of Pentacles tarot card represents the point where we have achieved much of what we were working so hard for. Not so much that our path is completed, but a moment where we stop in gratitude of all that we’ve done. This may not indicate that you have indeed reached your goal, but you are striding confidently ahead to achieve it, knowing you have the tools you need. The Nines in the Minor Arcana are a sign of accomplishment. They are filled with self-confidence and self-control, finally independent and free. 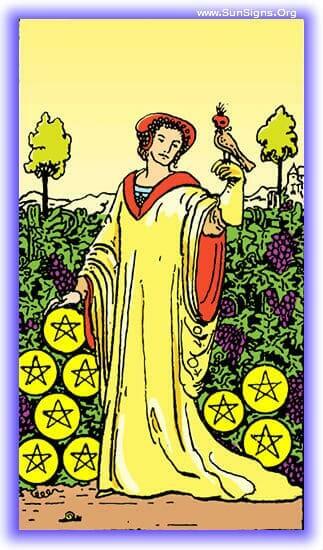 The Nine of Pentacles upright indicates financial and material gain, being full of appreciation for everything you’ve been through, and what you’ve gained along the way. It is a time where overabundance is unnecessary, and you are able to proceed with grace, living comfortably and self-assured. The past few months have been a glorious time in your life path. No exhaustion, no weariness. The fear and tension of constant concern over your welfare and situation has faded away into the past. Perhaps for the first time, you have felt secure in your holdings, and in your relationship with yourself and others. This indicates that your current situation requires you to conduct yourself with diplomacy and quiet aplomb. You are capable of great tact. And this circumstances call for it in spades, thankfully you have it within you to create harmony, and now is the time to apply that skill. You are so close, you can almost taste it. After so long of working towards reaching your goals, you can see it right ahead, and know that you’ll soon be there. While you are still uncertain as to the last few steps, know that before long all uncertainty will melt away, and your place in life will be clear in ways it never was before. When the Nine of Pentacles is presenting to you in a reversed state, it means that you’re likely experiencing some troubles financially, and most assuredly they are due to actions you probably knew better than to take at the time you made the decision. It represents a desire to lead a luxurious life, but there are barriers standing between you and that goal, including a deep desire to be surrounded by beautiful things, but not ruled by them. In the past few months, work has been taking up far more time than is healthy for your personal life and happiness. It’s felt necessary and you’ve been trying to maintain a certain standard of living, but you’ve fallen into the trap of ‘living to work’ instead of ‘working to live’. You’re not happy and you know it, you’ve been dedicating a heavy amount of work trying to maintain your standard of living, but instead of the things you earn making you happy, they’re making you progressively more miserable. Remember “The things you own, wind up owning you” is a very real danger of material acquisition. Focus more on having a quality of life, rather than a life full of quality things. On the road to your current goal, there are going to be some complications that may set you back quite a ways. You may have a decision to make purchasing something that will wind up being a burden on you. This is a caution against owning material things that will, through the incurred debt or obligation, will wind up not bringing you the joy you hoped for.